Gold prices, like crude oil, have skyrocketed--see my previous post. 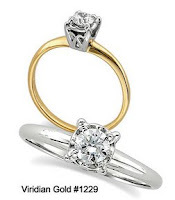 One way that jewelry manufacturers have attempted to address this is by making some jewelry designs that use less gold. For instance, we carry lots of crucifix pendants, and one of these, our Byzantine-style crucifix, #5441, is made with a unique, hollow construction. The front of the crucifix carries an intricate design, and the back is flat, with a delicate, "engine-turned" finish. But, the pendant only weighs just over 2 grams in the 1 5/16" size. 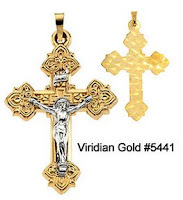 If you compare this with some other cross and crucifix pendants we carry, you will notice that it is lighter in weight than some other styles that have similar dimensions. That's because this crucifix is hollow--if it was solid, it would probably cost about twice as much! You see, a piece of jewelry that is labeled "14K Gold" must be 100% 14K gold--it cannot have any other metals as part of its construction. So, if the inside of this crucifix was filled up with lead, for instance, to make it heavier, it could not be labeled as 14K gold. Some designs are hollow just so that the piece will be affordable! We recently had a customer return one of these crucifixes. The problem is that we all have expectations of the "heft" of a piece of gold jewelry of a particular size, and this item was disappointingly lightweight to her. Even though the description on our website of this crucifix did mention that it was hollow, and of course we also provided the weight of the item in our specification table, we went back and added a more obvious reference to this fact so that it will be more noticeable. 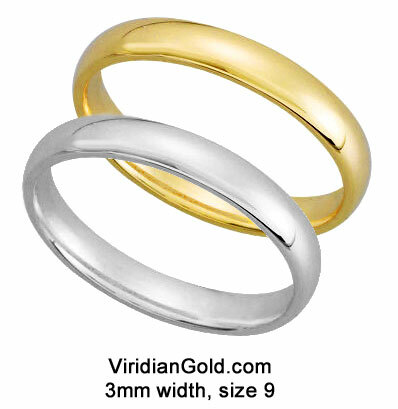 If there is one thing we wish at Viridian Gold, it is that our customers always feel that the item they receive from us meets or exceeds their expectations!